Maximize mobile conversions with sticky add-to-cart bar & better visual experience. Get to know why 10,000+ e-commerce store owners are using Mobile Converter to make more sales from mobile. owners are using Mobile Converter to make more sales from mobile. Mobile internet use is increasing at a rapid rate. However, conversion rate on mobile is much lower than desktop. Improving user experience on mobile is a priority for eCommerce store owners. Created to maximize the potential of mobile commerce, Mobile Converter helps you optimize the shopping flow on your mobile web and convert your mobile visitors into buyers. Set a fixed call-to-action bar on top or bottom of the mobile screen while your customers are scrolling up or down on the product pages. Make the Call to Action button stand out, always available, and nudge them to hit the button to start buying from you. 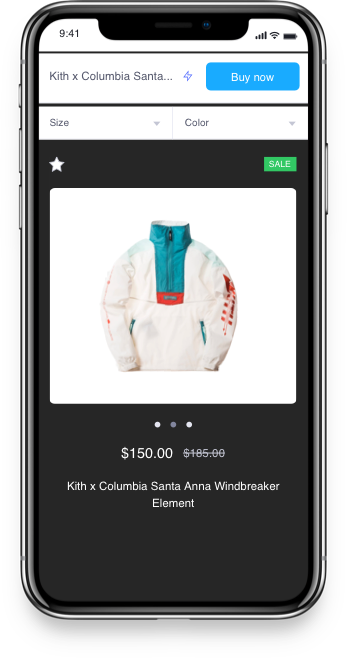 Display your product images in a full-screen view with a sticky Add-to-cart button, so your customers can view and buy your products immediately on the mobile web. Influence sales by simplifying site navigation and delivering a superior visual experience on mobile. Take up minimal space and resources on your mobile site. It is more like an element of your store, not an add-on. Requiring no coding skills, Mobile Converter saves your time with 1-click integration and simple setup that takes less than 2 minutes. "Lovely app. Does what it says. Its all good for a freebie!" "With 70% traffic on mobile this really makes it easy for conversions. The integration was just 1 click." "The app looks nice and is a good companion for a mobile look. The app needed some tweaking to work well with my theme but the support people where great." "A very useful app, very powerful. And it is free, thank you for this, it will really help me with my webstore !" "The team was in their response and action to an issue I faced. An efficient app that comes with support from a professional team."